In other articles in this New Energy Times special report, we reviewed the research efforts of people such as Thomas Passell, Xing Zhong Li, and Yasuhiro Iwamura to search for, identify and characterize possible low-energy nuclear transmutations. We reviewed their precise, thoughtful and clear investigations and powerful results. In this article, we review an effort by a group led by LENR researcher Vittorio Violante at ENEA Frascati. Violante is part of the LENR consortium of Michael McKubre (SRI International), Peter Hagelstein (MIT), the Naval Research Laboratory in Washington, D.C. and the former Energetics Technologies laboratory in Israel. This consortium has claimed for at least a decade that the products of LENR are excess heat and helium-4 - and nothing else: that is, no neutrons, no energetic alpha particles, and no transmutations. 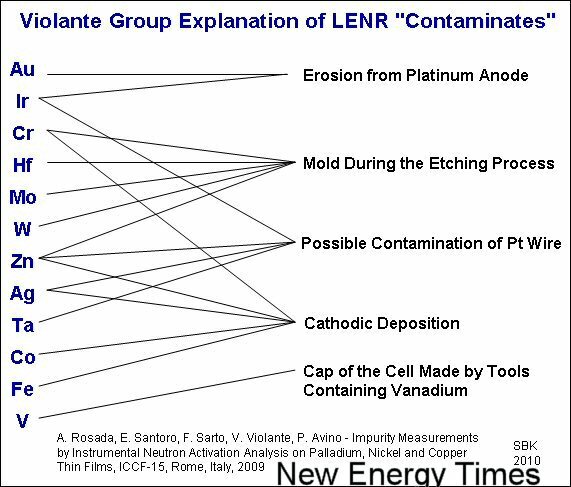 As they reported in October 2009, Violante's group tested and found anomalous elements after a LENR electrolysis experiment. However, the researchers attributed the anomalous elements, all 12 of them, to a variety of ordinary contaminants. They even attributed some of the elements to multiple sources of contamination. The authors stated that "all the procedures and the experiments [were] performed in a class-100 clean room." The group presented this work at the October 2009 ICCF-15 conference in Rome, hosted by ENEA Frascati. Violante is considered a prominent researcher in the LENR field; he was the chair of the ICCF-15 conference. He was elected to that position in a private meeting by, among others, McKubre, Hagelstein and ICCF-14 chairman Michael Melich. Violante also had been invited by these same Americans to talk at the 2004 Department of Energy LENR Review. New Energy Times reported on his participation and his puzzling claims there in our January 29, 2010, issue. In the work reported in October, Violante's group performed a light-water electrolysis experiment using a variety of cathode films, palladium, nickel and copper. The main thrust of this paper is the researchers’ claim that all 12 of the anomalous elementals they observed in the experiment have conventional explanations – that is, no transmutations, no anomalous isotopic shifts. The Violante researchers used neutron activation analysis, without a doubt the most rigorous tool for the job of characterizing many elements. However, the search for anomalous isotopic abundance, for which NAA is also superbly qualified, is strikingly absent from their presentation. A significant problem with their presentation is the way the six pages of data are presented. Only page 13 appears to have control (or baseline) data. Nowhere in the presentation are direct comparisons between elemental analysis before and after the experiment. This weakness makes careful scrutiny of the presentation difficult without replotting the given values in a new table. Another problem is that, although quantities of several new elements from post-electrolysis are shown, no counterparts for the measurements of those elements appear on the page for the "blank" electrodes. This complicates knowing what the pre-electrolysis levels were, unless the reader assumes that such elements were initially undetected. Without performing an exhaustive secondary analysis, let us assume that the anomalous elements the authors reported in their conclusion are well-supported by data and well-differentiated from pre-electrolysis conditions. The authors report anomalous levels of gold, iridium, chromium, hafnium, molybdenum, tungsten, zinc, silver, tantalum, cobalt, iron and vanadium. However, in the Violante group’s work, the researchers use a defective logical bridge to connect the data and the conclusions. On one side of this logical bridge are meticulous details of data. On the other side are a few brief sentences claiming that the source of these measured anomalies is contamination. But the presentation provides almost no detail about how the researchers performed tests which supported their conclusions. The only information that suggests anything about their judgment process is that they tested their lab gloves and paper using NAA. Presuming that they wore gloves and used lab paper for their control experiments as well, this should be irrelevant, or would be irrelevant had they shown a direct pre- and post-experiment comparison. The researchers account for the anomalous presence of gold and iridium by "erosion from the platinum anode." It's certainly possible; electrochemistry is messy. But what did their control experiment show? We don't know; they didn't tell us. They account for the anomalous presence of chromium, hafnium, molybdenum, tungsten and zinc by "mold during the etching process." Exactly how did mold contribute to this contamination? In a class 100 clean room? And did this mold affect only the test experiments, not the control experiments? Again, we are left in the dark. For the anomalous presence of silver, iridium, tantalum and zinc, they claim "possible contamination of Pt wire." The same questions prevail: How did they determine this possibility, and what happened with the controls? For the anomalous presence of silver, cobalt, chromium, iron and zinc, they claim electrochemical "cathodic deposition." This is certainly possible if enough of these elements were present in the starting electrolyte, but that is very hard to tell based on the information given. The skepticism inherent in the electrochemical cathodic deposition speculation is, of course, not new. Some people have offered this suggestion for two decades as an explanation of LENR transmutation. Last is the explanation for high levels of vanadium. This, they claim, came from the "cap of the cell [that] was made by tools containing vanadium." A cross-reference map will help readers visualize which elements, according to the Violante group, were caused by the respective form of contamination. The group claims that many elements came from multiple sources of contamination. The group did not explain what percent of each of the elements came from each of the claimed contamination sources.